Pure Mustard oil for external use. Mustard (Brassica nigra) belongs to the Brassicaceae family. The oil is obtained from mustard seeds. Mustard boasts of multiple health benefits. 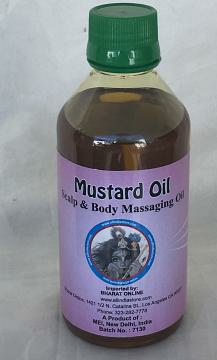 Massaging your scalp with mustard oil stimulates hair growth by increasing blood circulation in the scalp. It is packed with vitamins and minerals, particularly, a high amount of beta-carotene. This beta-carotene gets converted into vitamin A which is excellent for hair growth. Besides, it contains iron, fatty acids, calcium and magnesium, all of which promote hair growth. Mustard oil is effective in preventing premature greying and darkens your hair naturally. Thus, instead of dyeing hair, you can massage your hair with mustard oil every night to see the result. Mustard oil acts as a hair vitalizer to combat hair loss and baldness as well as treat dry and damaged hair. It prevents scalp infections by inhibiting fungal growth and keeping it hydrated. Mix with coconut or almond oil if needed. Mustard oil is extremely beneficial for skin also. Removes Tan and Dark Spots [when used as a face mask mixed with bengal gram flour, yogurt, lemon juice). In order to make your facial skin smooth, apply a mixture of mustard oil and coconut oil on your face and massage the area in circles for 5-6 minutes. Gently wipe your face with a smooth and wet cotton cloth. This will stimulate blood circulation, thus lightening your skin as well as getting rid of pimples. Stimulates sweat glands when used as a massage oil. This item in Ayurveda & Remedies category was first added to our catalog on 11-08-2015. Buy Mustard Oil, Brassica Nigra Natural Hair Oil, sold & shipped by Fabulous India where you can shop online for Natural Holi Color Powder, Hair Oil, Henna Powder, Indigo & Vitamins. This Mustard Oil collection has been tagged as Mustard Oil, Herbal Organic Body Massage, Scalp Massage, Ayurveda, Natural, Massage Oil.